Drawing inspiration from his favourite artist Durer, Eduard produced artwork for numerous magazines before moving to computer game design, and then joining the MGL studio. Eduard believes that a great jigsaw needs great artwork and as such strives to deliver this each and every time. Pickups and Produce is no exception, each scene are visually impressive with vibrant colours and loads of intricate details and beauty. 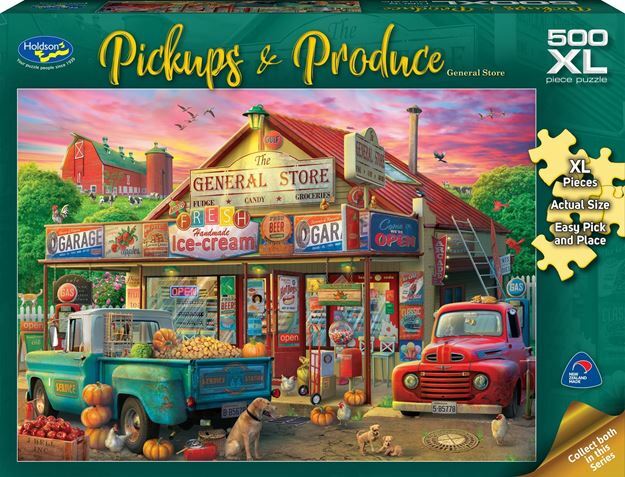 Titles include: Farmhouse Market and General Store. Each design sold separately. Collect both designs. Age 8+ years. Made in New Zealand by Holdson. Approximate puzzle dimensions: 688mm x 493mm. Box size: 270mm x 370mm.